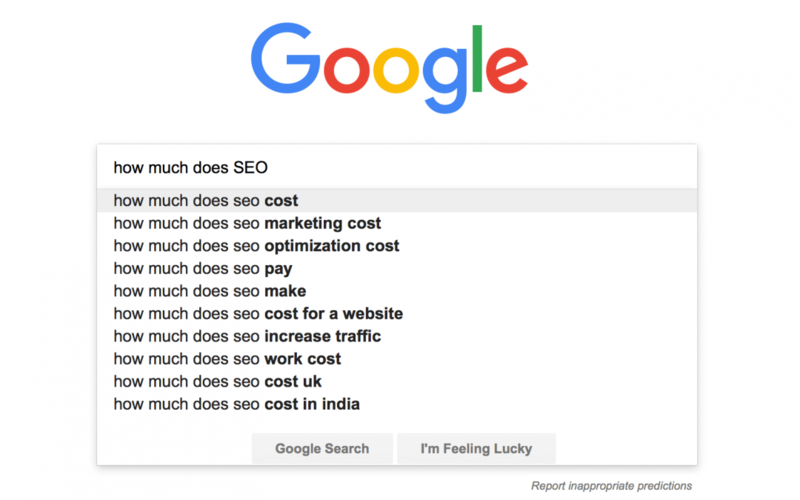 SEO Cost | How Much Does SEO Cost and What Is The Return? If you want your business to be found online, some degree of Search Engine Optimization is necessary. In the early days of the internet, so few businesses had websites that a quick search might turn up all of the relevant results you could find on the first page or two of Google. Now, however, competition is fierce, and people usually don’t even touch the second page of Google. In addition, search volumes are way up! People are searching before they make a purchase more than ever – and any business that makes it to the first page on Google has an advantage over others. 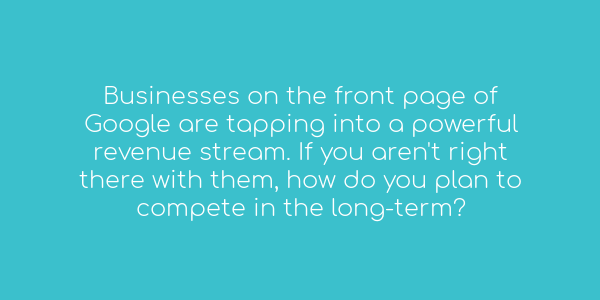 But let me put it differently: Every business website that doesn’t make it to the first page of Google is at a disadvantage and is losing potential customers to its competitors. For the sake of business longevity in this digital world, search engine optimization is a must. This creates a dilemma for business owners: Do you invest precious capital into this type of service at the cost of not investing that capital somewhere else? If you’re here, this is probably already a real dilemma for you, and your response to this problem will probably be based largely on the following: What is the cost? However, that decision needs to be equally based on the answers to these questions: What is the return? And what is the cost if I don’t invest in SEO? And that’s why I’m writing this article. You as a business owner need to be informed not only about what the cost of SEO is but why SEO costs what it does and what you stand to gain from it. If you do some quick research on SEO costs, you’ll see a lot of different options. Some sites say you can pay for each keyword that they successfully rank up, costing upwards of $100 per keyword per month to get high rankings. Another business charges anywhere from $180 a month to $2,500+ depending on the service package you choose. And a lot of others don’t give prices at all – they simply allow you to request a proposal (like we do at Chime). Everyone is quoting prices differently – so what’s the difference? Well, when you purchase “SEO” from someone, you’re getting more than just “SEO”. You’re getting a combination of services that are supposed to help your site rank higher. Those services and their quality vary based on the business. Before we keep going, here’s a quick list of the most common services that get grouped into “SEO”. If you update the content on your website regularly, then the new content you add may not be SEO friendly. Google is always changing its algorithms and technology is always evolving. What was working a few years ago (or in some cases, a few months ago) may not work as well now, and adjustments will need to be made to avoid losing rankings. Keyword and Competitor Research. Another cornerstone, keyword research is the process of finding keywords relevant to your business that will be targeted during your SEO strategy. Trying to do SEO without doing keyword research beforehand is like running a marathon only to find out that you were on the wrong track. You did a lot of work, and you technically ran a marathon, but you don’t win anything for that. Keyword research is generally paired with with competitor research because you probably aren’t the only business trying to get ahead. You (or the person doing SEO work for you) will want to know everything you can about where your competitors stand in relation to you so that strategies can be implemented that get you in the running for the top ranking spots. To do this efficiently, specialized software is required. Backlink building. Effective backlink building is the process of creating good links to a website. Google becomes aware of these links and ranks the targeted website more highly as a result (the mindset being that if trustworthy people are linking to your website, they must think it’s worth something). Backlink building requires time, analytics, and special software to do efficiently. It is usually paired with a content creation and promotion strategy, because if you’re making great content, it’s A LOT easier to get good links to your website. People love sharing great content, and that builds links. Content Development. This is a powerful way to raise search rankings, but it’s often the highest costing part of good SEO. A strong content campaign starts with great keyword and competitor research (as mentioned above) – and then based on those findings, a content strategy is developed and content is created accordingly. This requires a professional writer who is experienced in your field of business, and in the case of some content, a graphic designer is needed. When paired with a solid link-building and online PR strategy, content development yields great returns. Citation Building. If you have brick and mortar stores, you definitely want citation building and maintenance. These send clear signals to Google that you have a real company, and that influences your website’s rankings in search engines. While these citations can be maintained individually, the process can be very time consuming, and it is usually more cost effective to use software to do it (more on that further down). Local Search and Google Maps Optimization. Effective Local SEO generally requires the above services, but it also involves a little extra investment. If your business has brick and mortar locations, citations are very important, but having your Google My Business listings and website set up to properly handle multi-location ranking is important. If your company is a service area business (like ours), you may not have a public address for Google – and in that case, new pages with unique content may need to be set up on your website for each location you service. These services, when done properly, have a positive effect on your search rankings. The amount you invest into SEO will determine how effective it is. 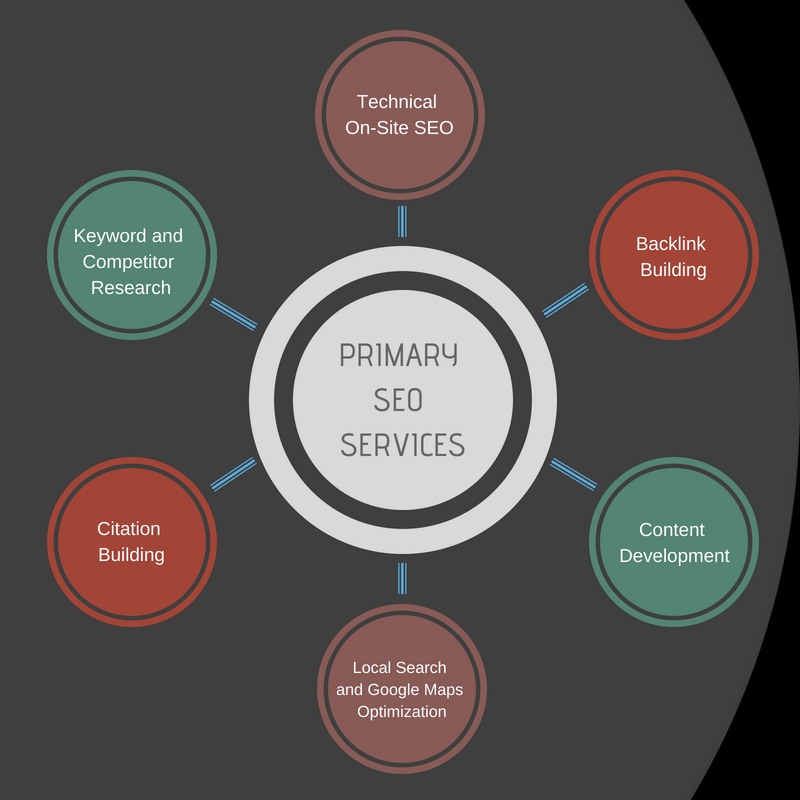 These services don’t work alone, and when you purchase SEO, you should be purchasing a combination of relevant services. For example, investing in keyword and competitor research does nothing if you don’t follow up with onsite seo, content creation, and backlink building. SEO services are deeply connected to other digital marketing services, and can be helped or hindered by this. A solid social media campaign, when combined with a great content campaign, builds more backlinks. The traffic generated from an SEO campaign combined with an modern, conversion-focused website design will result in far more paying customers than an old website that isn’t designed for customer conversion. Perhaps most importantly, your needs vary based on your competition. Your budget shouldn’t be the primary determining factor that decides what you invest into SEO. 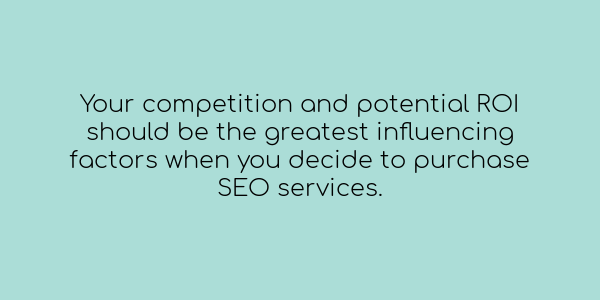 Your competition and your potential return on investment should be the greatest influencing factors when you decide you want to purchase SEO services. Am I saying budget doesn’t matter? Of course not. No one can afford what they simply can’t afford. What I am saying is that the world is becoming more competitive, and you have to both stay in the game and get ahead of your competition. On top of that, there’s a reward for doing so. So, without further digression, let’s talk cost of services, service quality, and the factors of competition and return on investment. We’ll divide this into levels of need and competition, and we’ll talk about cost within those levels. With a little bit of time you can probably manage a lot of this yourself and save a chunk of money. Check out places like Moz Local or Synup (these will help you easily manage and maintain your listings) and read articles about setting up and optimizing your Google My Business listing. You might get a much better ROI from managing these things yourself if you can put the time into it, because a company like ours has to markup those products and services. Please be careful in assuming that you are hyper-local. I’m from Mississippi, and I lived in a small town that couldn’t even sustain a restaurant for more than a year or two. At a glance, you might say businesses in the town were hyper-local – but in reality, the population was traveling to nearby cities for nice food and entertainment. Some businesses were just losing to out of town competition, and they either didn’t know it or they didn’t know what to do about it. Your business gains revenue from local or near-local customers (a city or two away), you have competition for the front page of Google, and/or there are a considerable number of searches for your product. You can expect to spend between $700 and $3,000 per month if you fall into this category. That’s a big range, and it’s dependent on one thing: How much your competition is investing into SEO. You’ll need to invest enough to not only even up, but to get ahead if you want to be competitive. If your competitors have few backlinks, no content, and little or poor investment in citations or technical SEO, then you’re looking at the low end of the spectrum. But the more heavily they’ve invested, the higher your costs will be. Your business gains revenue from online sales and/or customers on a regional level and your competition is high. If you’re in this segment, you’ll probably need to spend anywhere between $3,000 and $6,000 per month (or higher, depending on how ingrained your online competitors are). Good and regular content is a must here, greater investment needs to be made into onsite SEO and copywriting, and if you have multiple stores, you’ll need some level of SEO services that affect each of them. As previously mentioned, what you spend will greatly depend on your competitors investment. Your business is campaigning on a national (or multinational) level. $10,000 per month or higher is generally the case here (although a few extremely niche, low-competition national businesses can thrive with a lower investment). Those numbers are pretty broad because needs and circumstances vary. The only way you’ll get a more exact estimate is by getting an analysis and consultation from an SEO company. That being said, at Chime we offer our consultations for free. It’s entirely possible (even likely) that someone will say they can get you great results in your industry for less than what I’m quoting here. And in a few cases, they might accomplish that (startups will often charge slightly lower prices to build business and to form an initial portfolio) – but SEO is one of those things where you get what you pay for. Due to the inherent costs of good SEO (solid content, non-spammy backlinks, thorough on-site optimization, etc. ), businesses who are selling quality SEO just can’t do it at an extreme discount. It’s not an inherently cheap service. To give an example of a bad SEO hire, our first client initially hired an SEO company that promised better rankings and a new website for about $300 a month (plus a setup fee). This client was in an industry and location that had some competition for the front page of Google, and high competition for the top three spots. Their site managed to make it to the front page for one of their keywords (because a tenth slot exists on the front page of Google), but their website was a mess, wasn’t getting much traffic, and was likely being penalized by Google because of poor design and bad SEO tactics. In addition, the citations built by that SEO company were a mess, and also contributed to their low rankings. They got what they paid for. After we took over, redesigned the site, fixed the citations, and made other improvements – after we did proper work – their rankings rocketed, and they have seen a dramatic increase in people who have found their site through online search (based on analytics data and their customer surveys). The lesson? Don’t ever skimp on your investments. If you’re going to invest in SEO, make a reasonable decision based primarily on quality. Speaking of investments, the last thing we need to talk about is…. It should go without saying that there is no point in investing in SEO if it isn’t going to earn you more profits or protect you from losing profits. So, how will SEO affect your revenue? What is the return on investment? There are several factors. Search volume. The more people search for your product, the more revenue you can earn from having high rankings. Visitor Conversion Rate. This is the percentage of website visitors that become customers. Average Value Per Sale. If you total your sales and divide by the number of sales, you’ll get your average value per sale (which is a good starting number for estimating ROI). Customer Lifetime Value. This is an estimate of how much revenue a person will generate over the time they remain your customer. This is more difficult to calculate without long-term data collection, but if you have been in business for a while, you might can come up with a rough figure for this. Investment Amount. The amount you need to invest each month to gain and maintain search rankings relevant to your business. To do a rough estimate, let’s say you’re currently at rank 10 on the front page of Google for a certain keyword. Let’s say that there are 1,000 searches per month for that keyword and about 5% of searchers click your site. That means that about 50 people are going to visit your site each month at that ranking. Now let’s say that 10% of visitors to your site become customers (5 customers per month) and that the average customer makes a purchase of $100 from your site or store. So at its current ranking (10) for that keyword, your site is making about $500 per month. That’s where a lot of people stop, but customer lifetime (or even partial lifetime) value is extremely important. Let’s say that your average customer will make you $1,000 over the course of a year or two – more if you retain them longer. A single new customer becomes far more valuable. In the scenario above, if each customer has a lifetime value of $1,000, then those 5 customers will be worth an additional $5,000. Now, let’s run these numbers again, but for the higher search rankings. Same conversion rate, but 25% of traffic goes to rank one, 15% for rank two, and 10% for rank three. How much is your business making per month (not including lifetime value) if your ranking rises to somewhere within ranks 1-3? Rank 1: $2,500 per month. Rank 2: $1,500 per month. Rank 3: $1,000 per month. That’s one keyword. One month. That doesn’t include customer lifetime value, and that doesn’t even include people searching for your brand specifically – and if you’re ranking for additional keywords then you’ll be pulling in even more revenue. Of course, as the final step, you’ll want to subtract your monthly investment to get your actual return on investment. Change these numbers to yours. Would that kind of revenue be helpful for your business? One more thing needs to be mentioned before we conclude: SEO is not like advertising. You can’t inject some cash and get a quick return. SEO is a marathon that takes months (and sometimes years) to see mature, resilient returns. That reality shouldn’t be a deterrent (SEO has one of the best ROIs of any marketing channel) but that fact should instead prepare you. 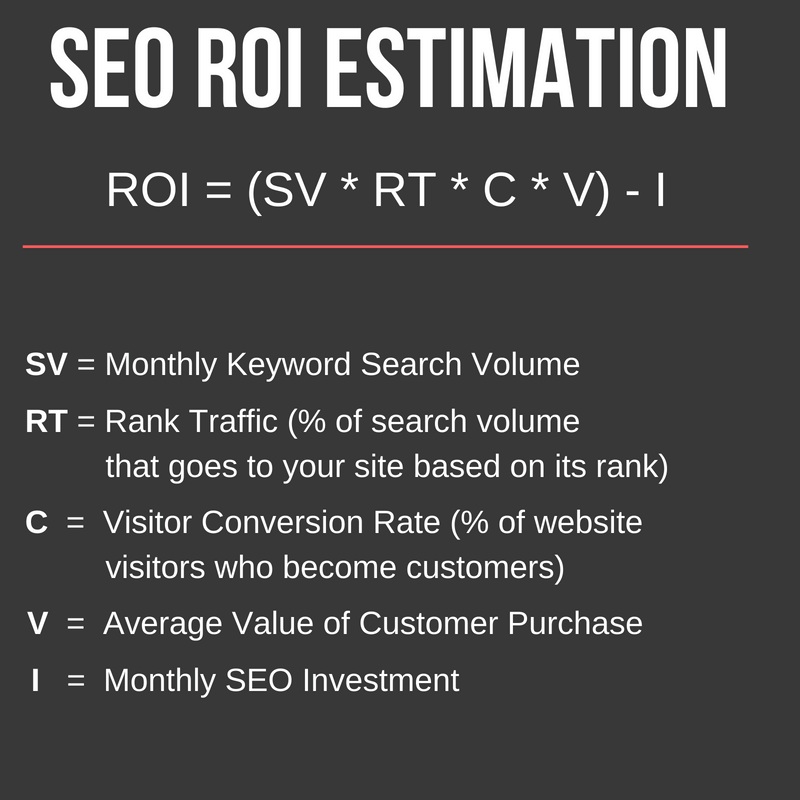 If you invest in SEO, you should be ready to commit in order to see full returns. This topic of ROI brings me to a final and important point (which may have gotten lost in the above text): SEO investment isn’t just about getting a good ROI; it’s about protecting your future business from competitors and, ultimately, potential lossess. That may sound like a big assumption, but think about it this way: If you don’t rank on the front page of Google while your competitors do, then they are effectively getting all of the traffic (and business) from searches. And people are searching more and more for businesses online before they buy from them. Those businesses on the front page of Google will be tapping into a revenue stream that you aren’t. They’ll grow, they’ll gain customers who will tell other people about their business, and yours will start either losing its clientele or it won’t gain enough new clients to be stable in the long run. Those other business owners probably don’t intend you harm – they are just trying to get somewhere in life, and they are doing it in the best way they can – but if you aren’t right there with them, their tactics will start to affect you. The question is, can your business afford that? If you would like to get a free consultation where we do a quick evaluation of your competitors’ online presence, the search traffic relevant to your business, and your potential for higher search rankings and increased revenue, fill out the form below! Even if you decide not to work with us, we would be happy to help you move your business forward in any way we can. If you’d like to learn more about our services or talk with us about helping you with your marketing, send us a message. We’d love to hear from you.